Still bitter that of all the billions of different coins, the only one that comes in its shape is some dumb coin from Slovakia. When it finally grew its fifth corner and was then able to play basketball with the bigger kids. Still angry over the US Government’s choice to use Pentagon’s shape for its super-strong national defense building, while only using Circle for the manhole covers in the parking lot to cover the sewers. When it first learned to bounce, and could then knock over sleeping Rectangles. It is now your turn to weigh in on this important debate. Other than that one time when Napoleon got really drunk, this kind of thing has never been attempted before. Therefore cast your vote so the world can finally begin to settle this most pressing quandary: What is the greatest shape? Cast your vote below, to decide who wins this round. On Saturday the voting for this round will end, the winner will be announced, and two new shapes will go head to head. I vote for the circle because of that delicious looking chocolate donut pictured above. Plus the word Pentagon sends shrills up my spine. LOL, I love the pictures. I've gotta go with the circle. Because after all, it's one ring to rule them all. Plus you know, that's just sad that the circle is relegated to manhole covers. That is great! 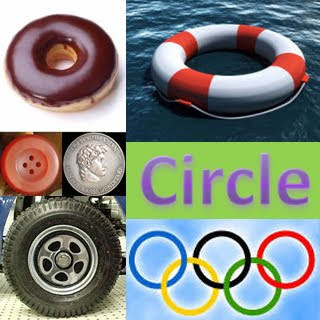 I am going with circle because I have yet come across a pentagon shaped donut. 5 sides is just too odd of a number. Sorry pentagon but I'm going to have to go with circle. I hope this doesn't hurt our friendship. Ah jeez everybody...the circle wins everytime. THE WHEEL...HELLO!!! And if you don't go along with me, maybe a trip the OCTOGON may convince you...hey...damn. I love round circles as I'm round. Your posts are so creative. For real! It's funny when I first saw your title, it made me think of an entire lesson I learned in Non-verbal Communications in college. People are different shapes like ectomorph, endomoroph and mesomorph, etc. It's crazy, there are actual characteristics of people linked to their shape, the way people perceive them and whatnot. As for me, it the circle, exactly. Um, seriously, is NO ONE going to stand up for the pentagon? I mean, sure, the circle has monopoly on, well, pretty much anything that rolls, but it's just so effing smug about it... with its pretentious infinite line and having to have a special number in order to calculate its size... I mean, pi? Really, circle? Who do you think you are?! 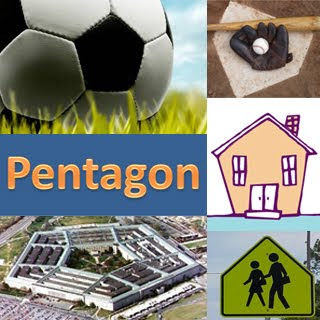 Not only is the pentagon obviously the coolest shape, being that it is has all the best qualities of a square and a triangle rolled into one, but it's the most intriguing shape. I mean, anyone can make a pizza shaped like a circle. But if someone made you a pentagon-shaped pizza, I bet you'd be extra impressed. Gotta go with the circle. It's more popular cause there's a lot more things made of them and after all, this is a popularity-contest world. Besides could anyone really drive a car on wheels shaped like a pentagon? Also a pentagon is too close to the devil worshiping pentagram! I feel that Amy made some really great points. I actually would like to have a pentagon shaped pizza. I'm changing my vote. In the book the sphere is the top dog (I think). AND, March 14 (3/14) was "pi day" so I feel like circles have a big advantage in popularity. I just realized pi doesn't work with the euro calendar. Snap. Long ramble - but in conclusion, the underdog, pentagon. But then Amy blew the door wide open and renewed my faith in the mighty pentagon! Roll away in shame circle! Roll away in shame! This is the great debate. I'm glad someone finally was brave enough to resolve it. Circle.